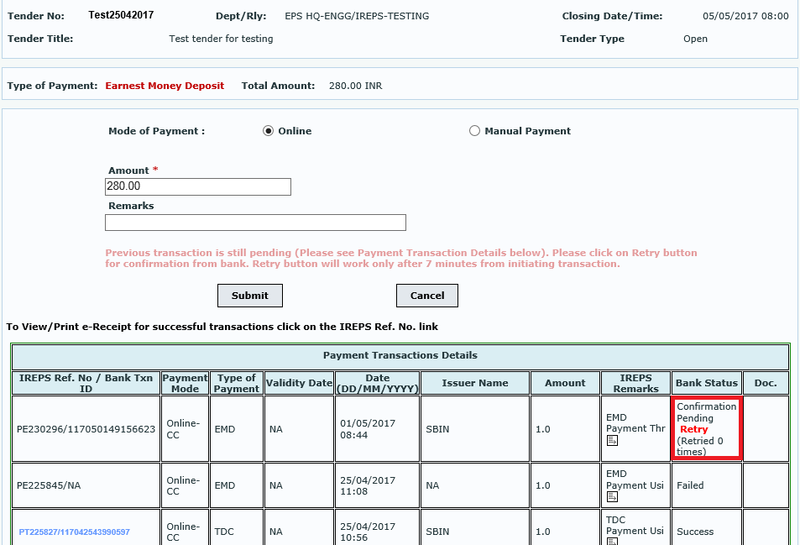 Click on the ‘Submit Payment Details’ icon to go to EMD payment page. 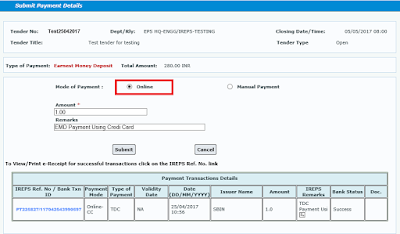 There are two modes of available Online and Manual; the user needs to select the online option to make the EMD payment using his/her Credit Card. 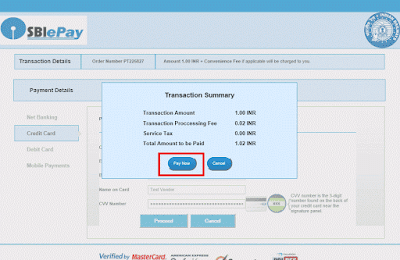 Select the mode of payment as online and click on the submit button. Here total EMD amount is Rs. 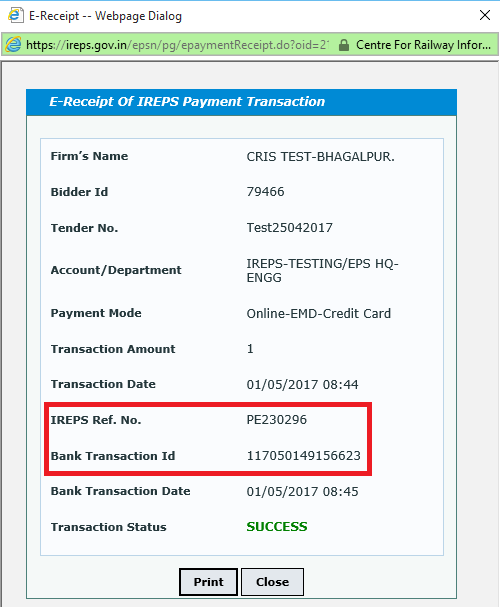 280 which needs to be paid for this tender but i am paying the EMD amount in parts and i am doing this transaction with Rs. 1. You will get the alert message "You are paying less than the prescribed Earnest Money. You will not be able to submit bid without paying full amount of Earnest Money. Do you wish to continue?" Click on OK button to proceed further. 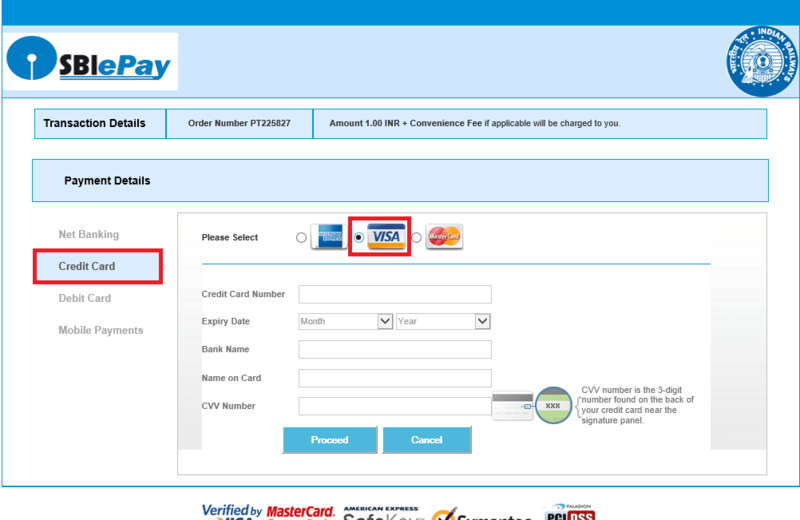 Select Credit Card option from the left side and select your Credit Card type from the list shown on the right side. 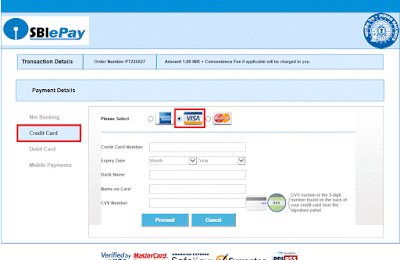 I have selected the VISA option for my VISA credit card. Enter the credit card details and click on Proceed button. 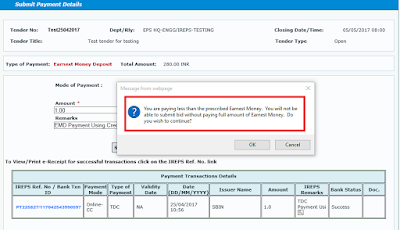 A pop-up will appear with Transaction Summary, please verify the transaction summary details and final amount to be paid. 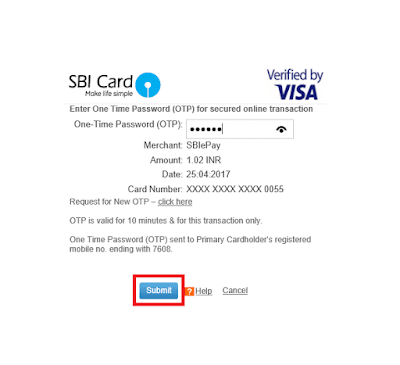 After verifying the details, click on Pay Now button and you will be redirected to next page for second step authentication. Authorize the transaction by entering the OTP or Password and click on Submit button to proceed for the final payment. 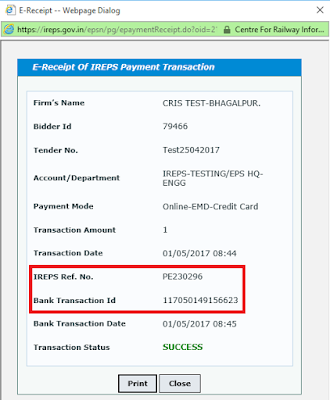 After successful payment, you will be redirected to your logged in home page on www.ireps.gov.in. 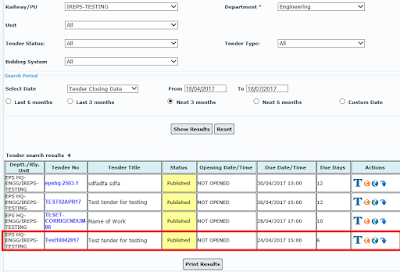 Click on My Tenders folder available on your logged in home page and after that clcik on ‘Submit Payment Details’ icon to go to payment details page to see the details of the payment which you have made. A pop-up will appear saying that "Do you want to run this application?" 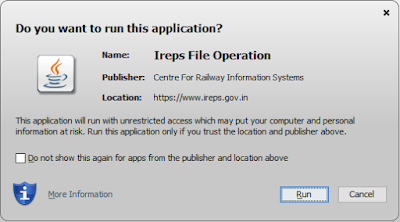 Click on Run button to run this application. If you want that this pop-up will not appear again then tick the check-box "Do not show this again for apps from the publisher and location above" and click on run button. 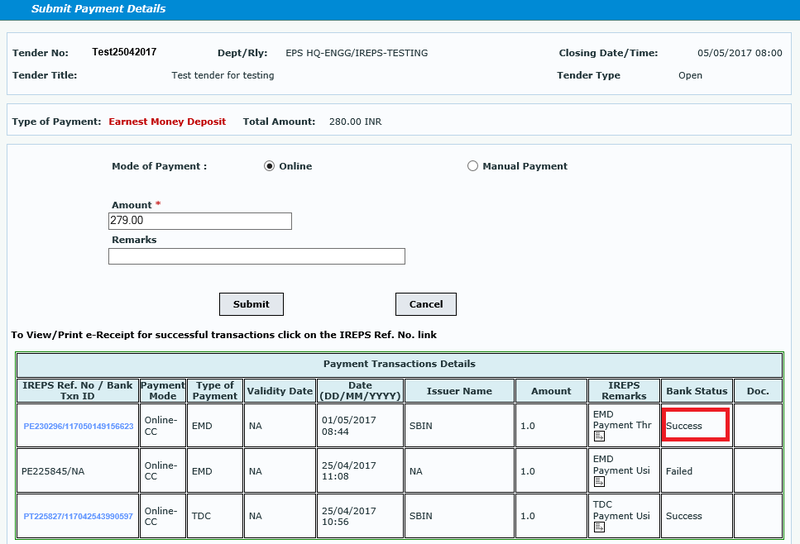 Check your bank status if it is Success then your payment has been successful and if it is Failed then your payment has been failed and you have to make the payment again. 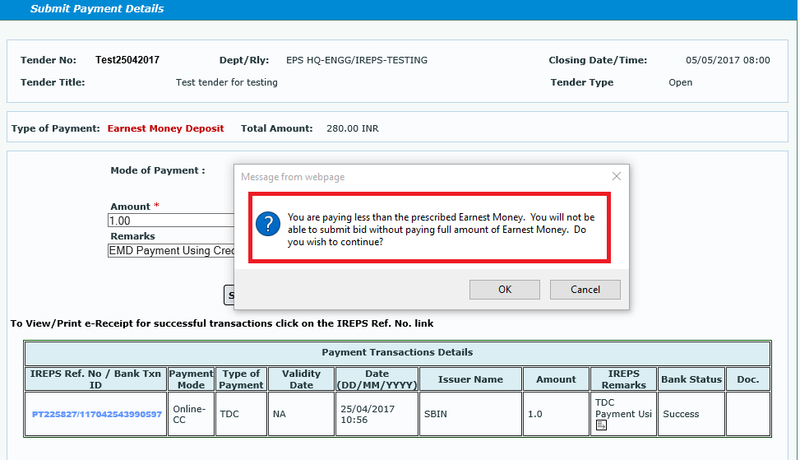 Otherwise, you will see the Retry option corresponding to the payment which you have made. 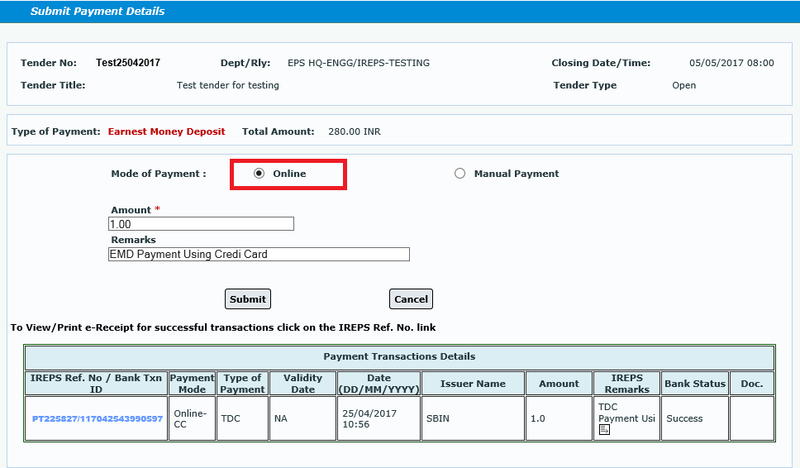 In May case it is showing Retry option, click on Retry button after 7 minutes of making the payment. When i clicked on Retry button before 7 minutes is is showing the message "Unable to verify this transaction currently. The failure may be either because you have attempted retry before 7 minutes from initiating transaction, or due to any other technical reason. Please try later. Please contact helpdesk if problem persists.". After 7 minutes when i clicked on the Retry button payment becomes successful and bank status changed to Sucess. Note: I have made this EMD payment using my VISA Credit Card. Can we use debit card for making huge payments of emd...Say 20 lakhs..??? Yes, there is no limit on amount. You can pay any amount through your debit card if you are allowed by your bank. 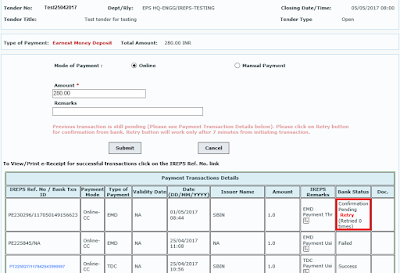 Can i use saving account debit card to pay 80000 emd? Yes, you can do if your bank allow you to pay the large amounts. Can I make EMD payment by two diff account. ( Eg. EMD is 180000 , 110000 by other debit card and 70000by credit or debit card is this possible???? Yes, you can pay the EMD amount in parts and you can also use the different payment methods for part payments. 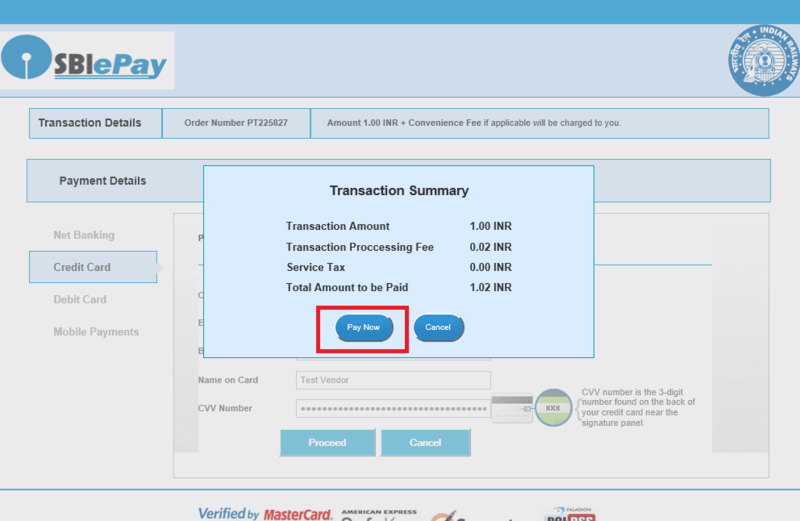 Yes, you can pay the TDC & EMD both using Rupay Debit Card. My payment of EMD from a computer located in Europe with a European master card repeatedly failed after going thought the banking process. 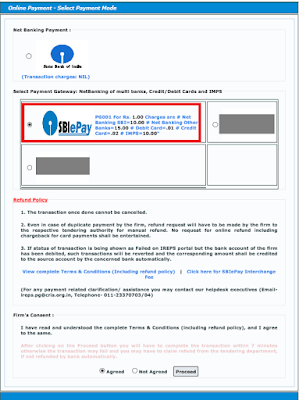 Is there any requirement to pay in India or with an Indian credit card? Had you made any successful transaction before from the computer which you are using? or you are not able to make any payment from that computer and card? 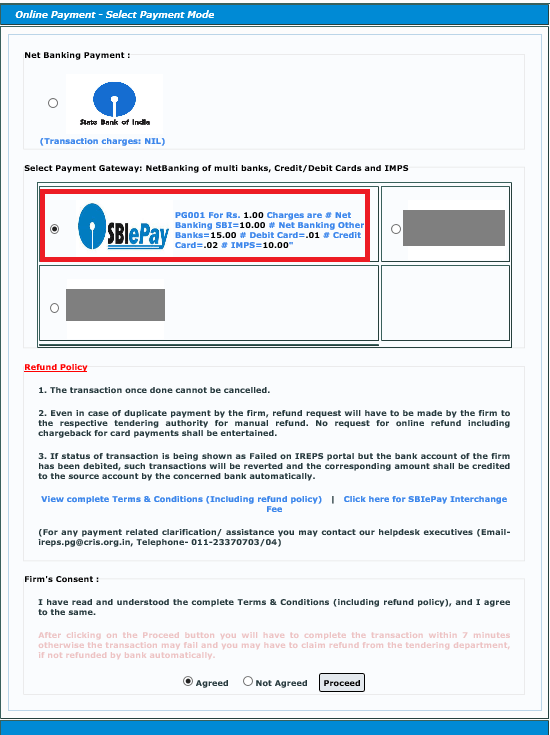 Can i deposit EMD through any other nationalized bank's debit card instead of SBI debit card? Debit Card: Maestro Debit Card, VISA Debit Card, SBI Maestro Debit Card, Rupay Debit Card and MasterCard Debit Card. 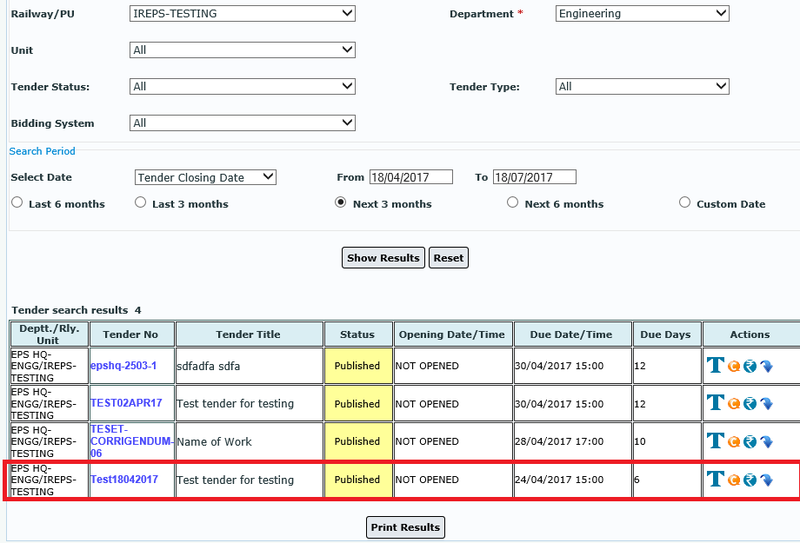 I paid the EMD but couldnt submit the tender. 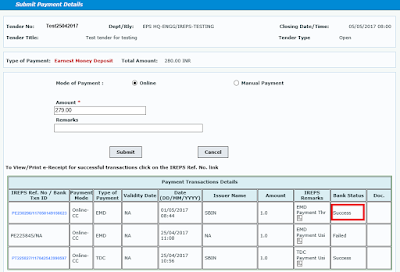 How can i get the EMD refund amount?